The Southwest Through Wide Brown Eyes: Double Stack to Fishmouth - Comb Ridge, Part Two. If you plan on doing the entire Comb Ridge road (CR 262) in one day; then you better plan well for it. You'll need loads of water, healthy snacks and stamina! Otherwise, the options are to camp at one of the numerous sites along the road; stay in a hotel/motel; or simply keep going back for short trips until you get it all done. Roy and I, since we live in Monticello, have the advantage of being able to go back whenever we want, and hike whichever trail we feel like doing. This write up is basically to give my readers an idea of what the entire road has in store for them. After doing the Wolfman Panel and Ruins; we spent the rest of the many hours in the area simply investigating trails and taking many photos of this most beautiful area. To follow along better, I'll repost the same map I posted in my part one write up of Comb Ridge. If you need to know the hiking and driving mileage, just refer to the map; the pertinent information is there. On this adventure, we're starting from the fence that is located at the trailhead to Wolfman Panel and heading north towards State Highway 95. About a half mile from there, look eastward and there is a cave, with what looks like ruins, within the cliffs; even my zoom lens couldn't make them out too distinctly. Actually, you'll see many cave openings along the way; what might look like ruins turns out to be simply dried mud and naturally carved sandstone. Cave eastward with possible ruins. Naturally carved mud and sandstone within cave. The next trailhead you'll come to is for Double Stack Ruins; there will be, to the west, three trails; the center and right trails lead to the trailhead and camping sites; the left leads to a camping area. After parking, you'll have to descend into Butler Wash, but going in and out at this section is easy as paths have been dug out of the walls. 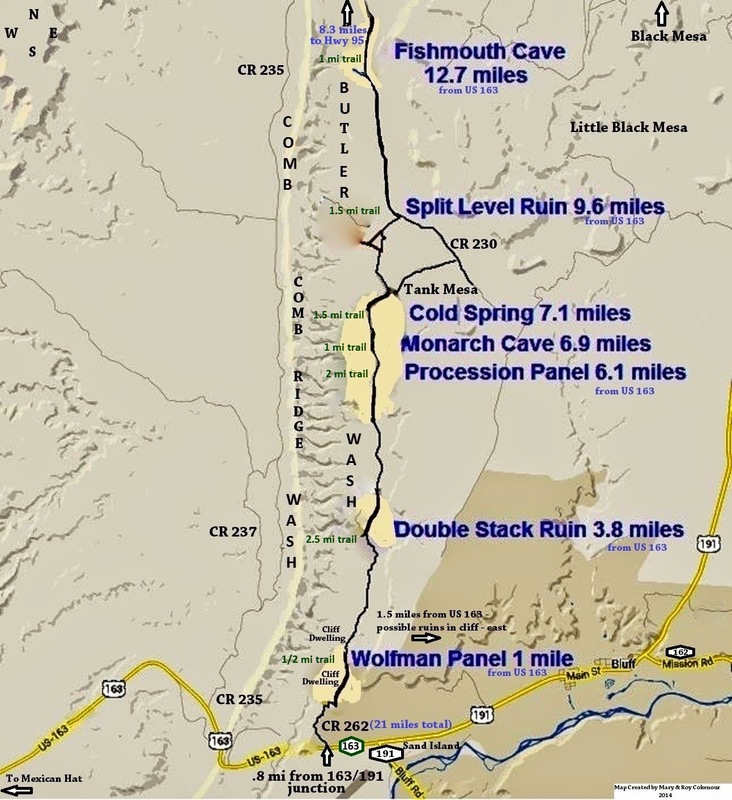 This is a 2.5 mile one way (5 mile round trip) hike to the ruins through areas of vegetation, desert and slickrock. Besides the ruins, there is rock art at this location (pictographs and hand prints). Easy descend into Butler Wash.
Easy ascend out of Butler Wash.
From the three way trail off CR 262, you'll see this Mesa up ahead. Pretty much the terrain on the hikes is the same; in and out of Butler Wash; desert, vegetation, slickrock. The road though is an adventure in itself; sand, rocks, potholes, chunks missing off the sides, miniature dry ravines caused by flood run off. 4 wheel drive is a must! The next three trails are for Procession Panel, Monarch Cave Ruins and Cold Spring Ruins; the scenery along the way is gorgeous! Close up shot of the mesa's pinnacle. From a distance, it resembles "rock art". It's simply natural discoloring, but there is a pinnacle nearby. On the way to Split Level Ruins, you'll come to a junction; CR 230 takes you past Tank Mesa and right back around to CR 262 again; it's simply a short detour if you want to take it, or not. Approaching Tank Mesa and junction for CR 230. Looking back at Tank Mesa from CR 262 heading North. Split Level Ruins is only a 3 mile round trip hike; it's getting in and out of Butler Wash that is that most difficult of the trail. It is very overgrown with vegetation; the hand and foot holds on the walls are extremely unstable. Suggestion for this is carrying a lightweight, folding ladder to help get into and out of the Wash.
Once again, don't forget to stop and take a good look at the scenery as you travel from Split Level Ruins to Fishmouth Cave. The closer you drive towards Fishmouth Cave, the more apparent it becomes in the wall of Comb Ridge. While it is a pretty awesome site, seeing the formation next to it only adds to the aquatic theme; it looks like a giant Ammonite. In case you don't know what I'm referring to, it is a marine fossil that looks like a spiral; Utah is known for these type of fossils, since it was underwater for a long while. Approach to Fishmouth Cave Trail. Area across from Fishmouth Cave Trail. Fishmouth Cave and "The Ammonite". If you stay on CR 262, State Highway 95 is only 8.3 miles away; you'll notice how Comb Ridge begins to lose its "comb" structure. Now notice how I wrote, "If you stay on CR 262..."; a half mile before you reach SH 95, the road will split; to the left is SH 95, but to the right... The right is also CR 262 and it goes for three miles before you reach CR 233 and this will also take you to SH 95 in a mile. Of course we took the road to the right, we weren't ready to stop adventuring yet! The condition of the road is still pretty much like it was going along Comb Ridge, but the scenery is gorgeous and you will eventually see SH 95 and Butler Wash Ruins in the distance. There you go, a good basis for your journey(ies) to Comb Ridge along CR 262. As Roy and I return and do the separate trails, I'll post write ups with photos. Don't wait for us though...Go, hike and enjoy!!! Hi! Have you been out on this trail in the winter? The pictures of the roads you took during your visit look intimidating! How would they be in the winter if snow was on them? Is it about a 4 mile drive on the dirt road before getting to the trailhead for double stack ruins? Thanks. From Hwy 163 (start of trail head near town of Bluff), it is 3.8 miles to Double Stack Ruins trail head. Then it is a 2.5 mile hike (one way) to the ruins themselves....NO motorized vehicles allowed to any of the hiking trails to any of the ruins along that road, only on the main road itself. Right now, we are having a dry fall/winter, so the road is dry, but sandy, dips and yes, you will need a 4 wheel drive vehicle. Thanks, Mary. This is helpful. The only other thing I guess I am confused about is- do we then have to park on Hwy 163 and walk the 3.8 to the trailhead (as no cars are allowed on that side road?). I was a little confused about that part. We are coming down that way during the Christmas time. Do you have any recommendations for easy ruins trails for us to see? I appreciate it! Your blog is very helpful! Look at the map above, County Road 262 (CR 262) is the 4 wheel drive only; the trail heads for all the ruins sites are listed with hiking mileage listed (one way only, so double for round trip). So no, you can drive the entire county road, but you must walk all ruin site trails. Since weather right now is cold, but dry, you should have a great time no matter where you go in the area. House on Fire, Cave Towers, Mule Canyon Overlook are good trails, and they're detailed on this blog as well; use the Search box to find them.